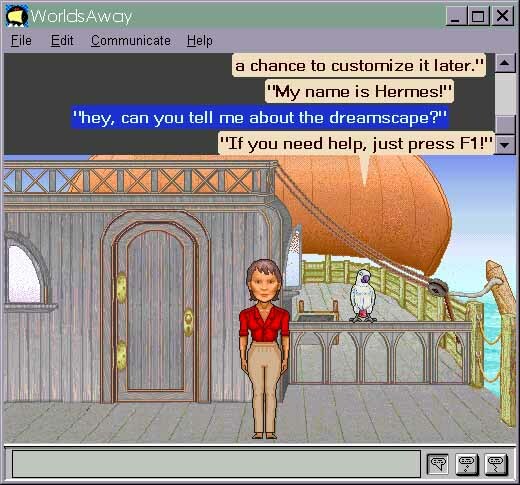 The Dreamscape is just one of many virtual worlds available through WorldsAway software. With WorldsAway, you can explore many different virtual worlds. The Dreamscape is the original, and is still the largest of these worlds. Once you have WorldsAway running, you can visit other worlds in the WorldsAway universe. Find out about the latest worlds on the WorldsAway Web site at http://www.worldsaway.com. This chapter will focus on the Dreamscape, but you will find that after graduating from the Dreamscape, other worlds will be a snap. The folks from Fujitsu have done a wonderful job designing the Dreamscape, and thousands of Dreamscape citizens have made it a place worth visiting. You will start your adventure by taking a voyage on the good ship Argo. Starting WorldsAway and entering the Dreamscape: All aboard! Before starting up WorldsAway for CompuServe, you must make sure you are connected with CompuServe Information Manager. If you happen to be using the Internet version of WorldsAway, you must establish your connection to the Internet. Once you are connected, double-click on the WorldsAway program icon to start up the WorldsAway application. The Internet version may require you to start your web browser before connecting. Instructions on starting the Internet version will be given at the end of the installation process. CompuServe dialer, Information Manager, and WorldsAway icons on a Win95 desktop. On the Macintosh, you should be able to find the WorldsAway program icon in its own folder. If you are using Windows 95 or Windows NT 4, you can find WorldsAway on your desktop, or under the Start menu (arrow) Programs (arrow) WorldsAway. In Windows 3.1, find WorldsAway in its own program group or look for the fjwa.exe file in the \fjwa directory. The WorldsAway for the Internet may be found in the \wa20 folder. 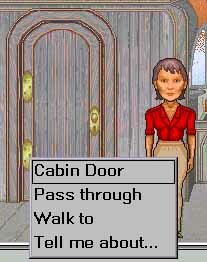 When you start up WorldsAway, you may see a dialogue box like the one shown in the preceding figure. 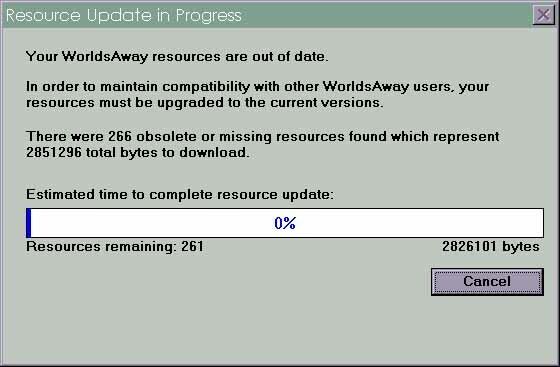 Donít panic, WorldsAway is just updating itself (usually adding new artwork or program code). If for some reason this update stops in the middle (your connection may have been lost), just reconnect to CompuServe or the Internet and restart WorldsAway, and the rest of the update will come in. 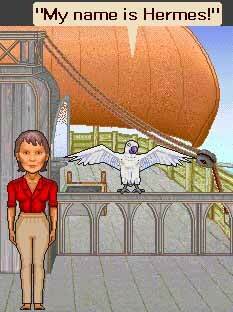 To get to the Dreamscape, you first must travel on a virtual sailing ship, the Argo. The Argo is your gentle passage to the Dreamscape. Instead of just a parachute landing into this world, you are given time to learn about how to move around, communicate, and do things. Your patient guide on the Argo is Hermes, a teacher parrot from the land of Morpheus. The Argo is taking you to the mysterious island of Kymer, described as, ìthe ancient island of reverie.î On that island is a city called Phantasus, where you will find many other dreamers like yourself. Arriving on the deck of the Argo. As you can see in this shot of the Argoís deck, that is me, or rather my avatar, standing there and looking rather like a plain-Jane. 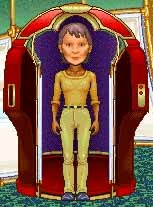 In WorldsAway, you start out with a simple avatar like this one, and while on board the Argo (and later in Kymer), you can choose a different body and head. Wait, that bird, thatís the famous Hermes! What is he saying to me? I can see his words in cartoon bubbles floating up above us both. He is saying a whole lot of things between wing flaps. But is Hermes a personówell, I mean, does Hermes represent a real person? Nope, Hermes is one of those strange critters you often find in virtual space called a bot, short for robot. Hermes is built just to respond to your questions, rattle off advice, and ask for a cracker or two! Wait, Hermes just told me about a special gift behind the door to the left. Are we on a game show here? Well, if it is a free gift, then the price is right, so how do I go through that door? Hermes is right there telling me to just click on the door. As you can see in the following figure, clicking on anything in WorldsAway brings up a little pop-up menu..handy! You will get used to this trick. Oooh, the secret door; but how do I go in? Just click and find out. Wow, the menu choices look pretty straightforward. I pick Pass Through, and my avatar walks right on through the door (after it opens of course, I would hate to get a black eye for everyone to see in Kymer!). And inside? Well, I went through, and I found my gift! But I donít want to spoil it for you by telling you everything! Youíve got to do it for yourself. All I can tell you is, donít pass up that gift. Boy, did I find it to be valuable later on! By the way, if you have a sound card and speakers on your computer, you will hear all kinds of great sound effects, like the sounds of the ship as it plies toward Kymer, and squawks from Mr. Hermes. Before I go inside anyplace, I can ask about it and get a bit of information read to me by the world itself?. This is kind of like talking to yourself, except that the universe talks back. This is the dawn of the New Age, is it not? Donít worry about exploring various places in the Dreamscape, you canít be killed, and wonít be trapped against your will. Click anywhere outside an object, get a pop-up menu, and go! Well, I was getting anxious to start wandering around the Argo, so I clicked my mouse on the deck, and got a pop-up menu like the one in the preceding figure. Choosing this caused my avatar to walk off to the right. The scene dimmed for a moment, and then voilà, I was in a new part of the ship! I can choose a new body on the Argo promenade deck. The world is talking to me, and telling me that I have to choose my body, head, and name here on the promenade deck. What looks like a twenty-first century Thai telephone booth turns out to be the body changing chamber! I click on it and get the choices of male/female, and then athletic/stocky and some other body type (well, overweight then!). Gee, I like me, so I think I will stay thin. 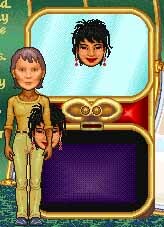 Well, even though I am actually a man, I kind of like the idea of trying virtual life as the other gender. 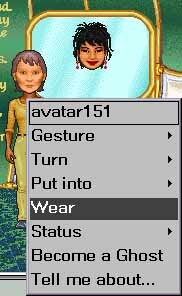 The avatar WorldsAway gives you in the Dreamscape is the medium-build female. I also like the athletic body shape I was given by the world (I am lanky and definitely not athletic in the real world), so Iíll just stick with the way I started. Buy that body! Signs near the body booth tell me that bodies on the island of Kymer cost 1,000 tokens, so I am glad I could choose mine now. Gee, tokensóit seems that there is an economy in the Dreamscape! Well darling, letís get you a new wardrobe! An ATM and head changer vendo are located on the promenade deck. Rolling right along the promenade deck, I see two other interesting machines. One turns out to be an ATM (short for Automated Token Machine). Clicking on this allows you to withdraw money from the private bank account you were given when you first came into WorldsAway. 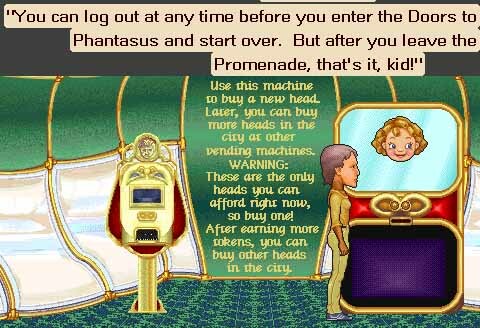 As you will see later, you can earn more tokens for the time you stay in the Dreamscape, through good old-fashioned wheeling and dealing. I rush past the ATM to the head vending machine. Vending machines, sometimes called vendos, offer you things to buy, and are scattered all over Kymer. 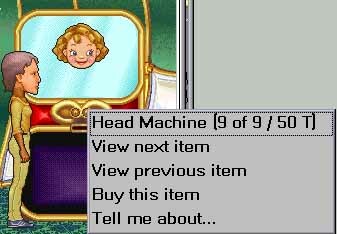 I really want a new head. No more plain-Jane for me! Click on the vendo, and roll through the items inside. is it worth two in the bush? and found a lot, including one to wear what I was holding. Bingo, I am getting ahead in this world! There are a lot of options you can access by clicking on yourself. You can turn your avatarís body, gesture (I just love jumping! ), put things you have into your pocket, check on your status (including the tokens you have), and become a ghost (lurk in the background, a useful skill I developed for parties in real life). I pick my avatarís name on the promenade deck of the Argo. Rolling along to the right, I come across the name registry where I can pick my avatarís name. As always, I am DigiGardener, a kind of ìJanet Appleseed,î putting down roots in virtual space. Docking at the Port of Phantasus on Kymer; permission to go ashore, Captain! Hermes again! We are pulling into the Port of Phantasus on the isle of Kymer, and this is the last chance to make changes to your identity before entering the city. If you really donít like what you see, or think you missed a step, you can close WorldsAway and restart it. You then will land back on the deck the Argo, and can go through the previous steps again. Once you leave the Promenade and enter Kymer it becomes very costly to change your identity and takes 60 days for an old identity to ëexpireí. Take a deep breath just before you go in. You will be entering a living, breathing community of people. Just because it is called a virtual community, that makes no difference. You will be talking and sharing experiences with real people from many cultures all over the world. I suggest that you take a glance at the, ìWorldsAway Guidelines for Community Oriented Behavior,î found in the FAQ at the end of this chapter. The main thing to remember in any virtual world is the good-old golden rule: treat others as you would like them to treat you in return. Follow that one, and you canít go wrong. Whoops, what if I canít get in! If you find at any point that you cannot get into WorldsAway or the Dreamscape, there may be a technical problem, such as a lost network connection, or the world may be too full. I suggest that you try again a little later.